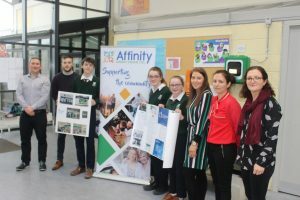 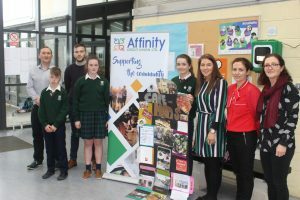 On Friday March 22nd Cashel Community School first year Business Studies students participated in an Enterprise competition in association with event sponsor Affinity Credit Union. 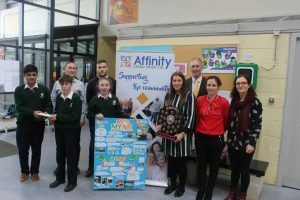 First Year students worked in teams to research local businesses and present their findings to their peers and teachers. The school was delighted to welcome author and DJ Meghann Scully to present the prizes and address the students. Front Row: Saadullah Saifullah, Joseph O’Flynn, Amy Wood, Judy Burke (Marketing Manager Affinity Credit Union), Ms. Claire Whelan & Ms. Ann-Marie Ryan.